This beautiful lighthouse is located in Atlantic City, New Jersey and is called the Absecon Lighthouse. When we visited the lighthouse it was a beautiful sunny day in May and I loved how the blue sky shows up in this photo of the lighthouse. What I love about this lighthouse besides it's beauty is that it sits a few blocks inland! Amazing that it's not right up on the coastline. The grounds are immaculate and it's a nice visit for lighthouse lovers like myself. 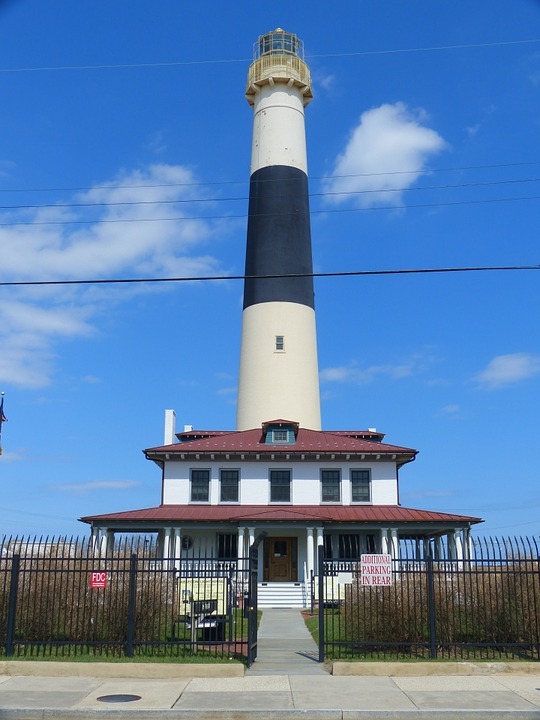 The Absecon Lighthouse has 228 steps that you will need to climb to reach the top and it's New Jersey's tallest lighthouse with its original first-order Fresnel Lens. 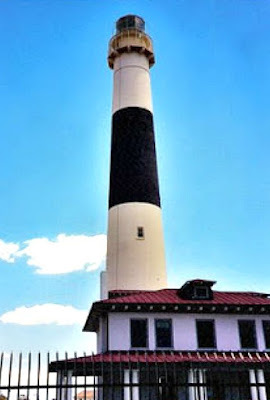 Once you climb all of the steps to the top, you will get some amazing views of Atlantic City and the surrounding area. Once you are done with your tour...you can stop into their amazing gift shop to pick up some souvenirs. The lighthouse is open year-round but the hours vary according to the season. It sits just a few blocks from the Atlantic City Aquarium so you can do both activities in just one afternoon. They do offer group rates and special tours upon request. You can reach them by phone at (609) 449-1360. It is a really lovely place to visit and after you are done there you can head over to the Atlantic City Boardwalk for some additional fun, grab something to eat or visit one of the many famous casinos that line the A.C. boardwalk. Historical lighthouse in the blue sky. Beautiful! Just stopped by..hope you don't mind I faved your blog...lots of interesting finds!